The Knight of Darkness battles strange supercrime in two pulp thrillers by Walter Gibson that foreshadowed classic Batman stories. 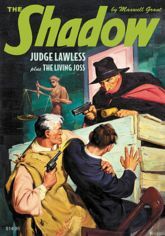 First, The Shadow goes undercover in Chinatown to battle one of his deadliest foes, the legendary oriental demi-god known as Kwa, The Living Joss. Then, what can prevent Judge Lawless from making a mockery of the law? Only The Shadow knows! BONUS: Djaruti, Goddess of Death, a lost Orson Welles thriller from the Golden Age of Radio! This instant collectors' item features both classic cover paintings by George Rozen, the original interior pulp illustrations by Tom Lovell and Paul Orban and historical commentary by Anthony Tollin.